Welcome to The Cat's Meow website! Motherhood is one of the most wonderful experiences in a woman's life. It is also one of the most exhausting. Here at The Cat's Meow, we strive to provide mothers with a few items to make that job a bit easier, so they can focus on the little miracle(s) in their lives. We offer a wide variety of handmade items to support green living and natural parenting. Through babywearing products, maternity and nursing items, and baby items we're helping to reach that goal, one mother at a time. 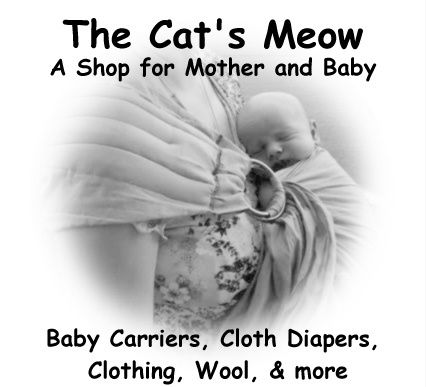 The Cat's Meow...the purrfect solution for mother and baby.